I never thought I could make money from writing, and it has taken until the last few years for me to achieve the dream of writing a novel. At school I usually got into trouble, however, I do remember clearly winning a prize for a writing competition. We had to write about a safe place – for me that was my bed. I could allow my imagination to wander to wondrous places. It was the first time I had been rewarded for something I enjoyed doing. But at that time I never imagined that in the future I would be writing a novel. I studied Spanish and German. Mum wanted me to study German although she never spoke it at home. I lived in Germany for a gap year – before gap years became fashionable, prior to going to university. After graduating I spent two years in Spain teaching English, worked as a cashier, croupier, marketing manager in London then with my husband spent time in the Republic of Kiribati and Papua New Guinea where I was asked to teach at a sixth form college where pupils came from many tribal groups and they had to learn to co-exist. Starting a business from writing. On return to the UK I studied for a masters degree in creative writing by distance learning, which was all on-line. It was very rewarding and being all on-line meant I could fit the learning and writing around my daily life, which, having a young family was a Godsend. When I finished, it got me wondering why there were no short on-line creative writing courses for beginner writers. As a result 11 years ago I set up and began to run an on-line creative writing school. Students can login at any time from anywhere in the world. They can share as little or as much information about themselves as they want and learn how to write in an inspiring and encouraging environment. We now have six courses for both beginners and more experienced writers, including those who want to start writing a novel. We also have six excellent tutors and our students are of all ages and come from around the world including Brazil and Abu Dhabi and Scotland. Catalyst for writing a novel. Four years ago I realized that I was helping others, and I loved telling stories but I wasn’t writing myself. I had always thought about writing a novel. This was about the time that my mum died. Shortly after her death, I was helping my father sort out her personal things when we came across a collection of letters, diary extracts, old postcards and faded documents, all in German. They dated back to before Mum came to Scotland after the end of the WW2 and trained to be a nurse in Leith Hospital, Edinburgh, where she met my dad. Dad, who was from Leith, was very keen I translate these documents and letters. Mum’s never talked about her early life and it was a bit of a mystery to the family: all we knew was she was from Silesia, which didn’t seem to exist in Germany and that she never saw her parents again after she left Germany. I was uncomfortable at the thought of reading my mum’s things; she’d been a very private person. However, Dad finally managed to persuade me. I started by translating a diary extract, which I first assumed had been written by my mother. However, it quickly became clear the diary extract(s) had been written by my aunt, Antonia, who had gone to live in Argentina after the end of the war. From her letters, it became clear Antonia had been very unhappy in Argentina. She wrote to Mum regularly and when she wrote she included an extract from her dairy, which dated to before the war and which she’d painstakingly retyped on sheets of airmail paper. This was what I was translating. The very first extract I looked at was dated 1947. It was one of the last she sent. I was shocked at the contents of Antonia’s diary. The more I read, the more I wanted to read. Much of what I discovered was distressing. I needed to know too if it was true so I went to the library to find historically accurate, factual, unbiased books, which would help me make sense of my mother’s life. By the time I finished at the library, I knew I had to write about what I had discovered. At first I thought I would write a biography, but I felt uncomfortable doing that: firstly because of the gaps in the diaries and letters, it was difficult for me to know for sure what had happened to my family throughout the whole of this period (1932-1947), secondly, I simply couldn’t write about Mum. It was too personal. How would I tell the story? Eventually I realized I could make it a hybrid fact and fiction. I created a fictional family and a fictional main character in Antonia, who is a combination of my mum and my aunt. Much of what happened to my fictional family happened to my real family, but much didn’t although it could have done – certainly, everything that happened in the novel is based on true historic fact. Next, I had to decide “how” I was going to tell Mum and Antonia’s story. I eventually decided to develop the format of a diary and letters: I wanted to try and recreate in the reader that same sense of ‘discovery’ I had experienced when I first translated the documents. 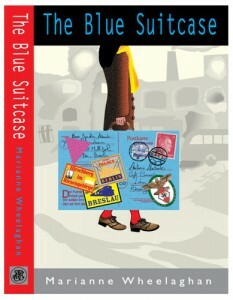 And that’s how The Blue Suitcase came to be: it’s the untold story about life under Hitler for an ordinary German family, but it’s also a story about a young girl growing up and surviving against terrible odds. Why did I write this story? Why did I feel so compelled to write this story? I wanted to right a wrong: when I was young there was an unspoken belief that all Germans were “baddies” and Hitler’s “willing executioners”. And I am ashamed to say, I remember feeling embarrassed at times because my mother was German. Now I know that not only were many ordinary Germans also victims of Hitler’s terrible regime, but that my mother was a refugee, and like millions of other German refugees, forcibly expelled from her home at the end of WW2. It seemed to me wholly unjust that the suffering of my mother and my aunt, and so many other aunts and uncles and mothers and fathers like them (on all sides), should go unacknowledged. Sadly my father died before the book was published. Once the book was written I started sending it to agents. Nothing was happening and my husband Marc suggested why didn’t he publish it? He has been looking after the computer side or our writing courses and had published educational books. That is how Pilrig Press was born. He has inadvertently become a publisher and now publishes for other people too. The interest in The Blue Suitcase has been remarkable. It has been listed a BESTSELLER in Blackwell’s bookshop and in the Amazon Kindle top ten time and time again. Writing The Blue Suitcase helped me find my writing voice and made me realise I had a lot more stories I wanted to tell. 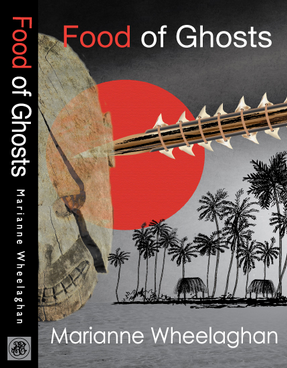 I went on, writing a novel “Food of Ghosts”, a crime thriller set on Tarawa, a remote desert island in the middle of the Pacific where I used to live. My detective is one DS Louisa Townsend (from Edinburgh): she is feisty, fearless and vulnerable – and miles away from home. A man is found dead in bizarre circumstances. Louisa is asked to investigate. With no forensics and no one telling the truth, Louisa worries she’s out of her depth. Pilrig Press published Food of Ghosts at the end of last year, 2012 and like The Blue Suitcase, the interest in it has been incredible! 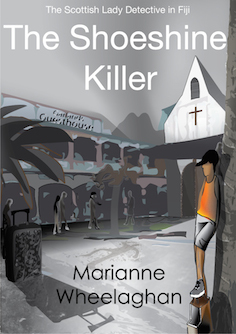 I am now writing a sequel to The Blue Suitcase and a follow up to Food of Ghosts. Writing a novel has now become a reality.